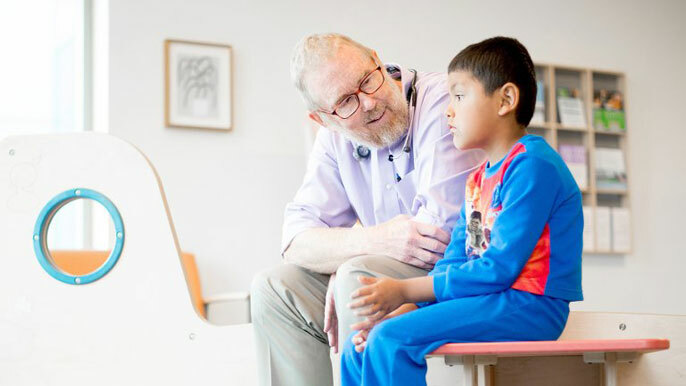 Tom Boyce, M.D., chief of UCSF’s Division of Behavioral Pediatrics, speaks with patient Lucas Asbury, 7, at the UCSF Ron Conway Family Gateway Medical Building. Boyce began studying psychological stress as a disease risk factor in children nearly 40 years ago. The idea that adversity increases the risk of disease later in life is generally acknowledged in the medical community, said Tom Boyce, M.D., a professor of pediatrics at UC San Francisco who began studying psychological stress as a disease risk factor in children nearly 40 years ago. Now health professionals and researchers are working to understand the psychological and biological connections between adverse events and trauma on health – and what to do to interrupt those effects. Nearly two decades ago, the connection between adverse childhood experiences (ACEs) and long-lasting health effects was thrust into the spotlight when the Adverse Childhood Experiences Study was published. It examined seven categories of adverse experiences — such as childhood maltreatment, parent criminal behavior and domestic violence — in 17,000 adult Kaiser Permanente members in Southern California. While that pivotal ACE study laid the groundwork for connecting the association of childhood adversity with many leading causes of morbidity and mortality, the number and scope of ACEs and their health impacts have expanded since then. ACEs now include detrimental experiences and trauma such as abuse, neglect, parental death or divorce or an environment of racism or violence. “We now understand that effects of adversity exposure can begin immediately when an organism is conceived and begins to develop,” said Nicole Bush, Ph.D., an associate professor of psychiatry and pediatrics who is determined to uncover the mechanisms of how early-life adversity affects chronic disease in humans. Edward Machtinger, MD, is leading a series of studies implementing and evaluating a trauma-focused care model for dealing with the impact of lifelong abuse. “What is lacking is a general awareness that we have the tools available to us to address the impact of trauma in adults that lead to ACEs in children and poor health outcomes in adulthood,” said Edward Machtinger, M.D., a professor of medicine who, as director of the Women’s HIV Program at UCSF, sees the long-term effects of childhood adversity on his adult patients. In his clinic, they are using trauma-informed methods to more effectively treat depression, substance use, chronic pain and other conditions that predispose parents exposing their children to ACEs. Trauma and adversity in childhood have been shown to impact long-term health. Health care professionals are working to intervene early to undo the effects before they become more serious.